I am so excited for this post! 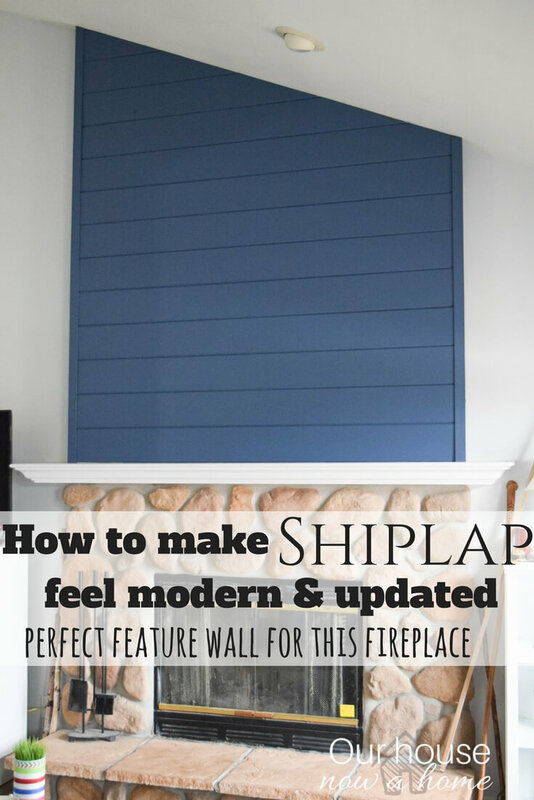 I am sharing all of the details of Creating an office space in a bedroom, adding function, organization and style. First of all, I am playing catch up a little around here. 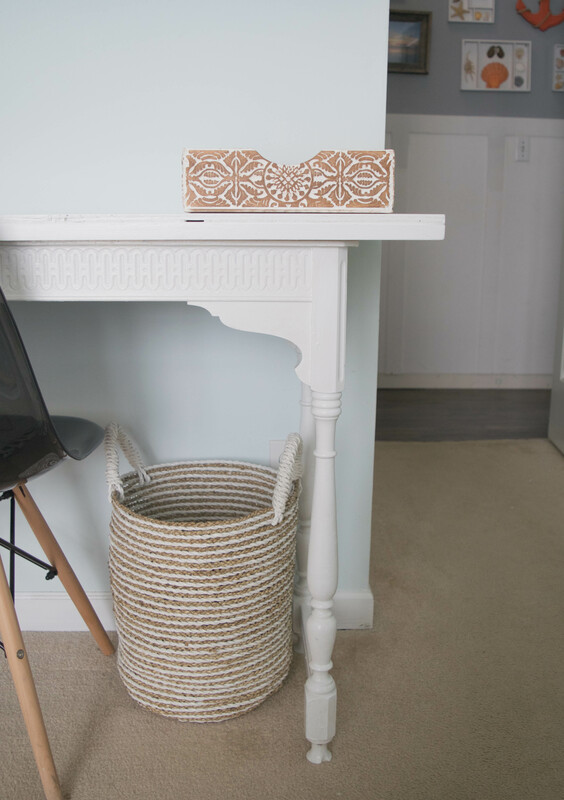 I have done a lot more decorating in my home than I have shared on the blog so this little work space of mine is in my master bedroom, which was recently updated. I hope to be sharing the full reveal with you next week! My Master bedroom is a big space, but it has to pack a big punch with function too. I have created a dual space here, combining my office space into the bedroom. The problem is I left the small office space really sparse. It was lacking in function, organization and even style. 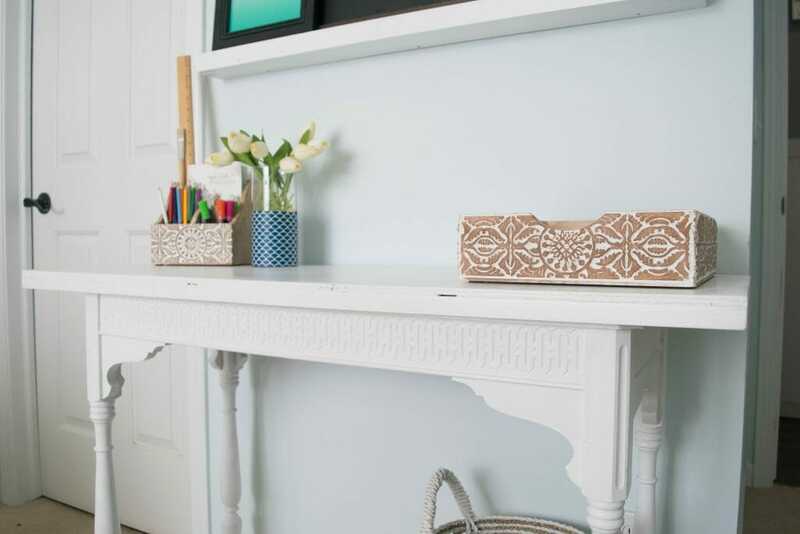 Yes, a home decor obsessed lady like myself put up a small console table and plugged in her laptop… calling it a day. Until now! The problem with this particular work space I had is first of all the size, I needed a bigger computer desk. But I love this one, so found a way to make it work. The second problem is obvious; zero organization. This is where I work during the day, it has great natural lighting so I do a fair amount of crafts in here too. 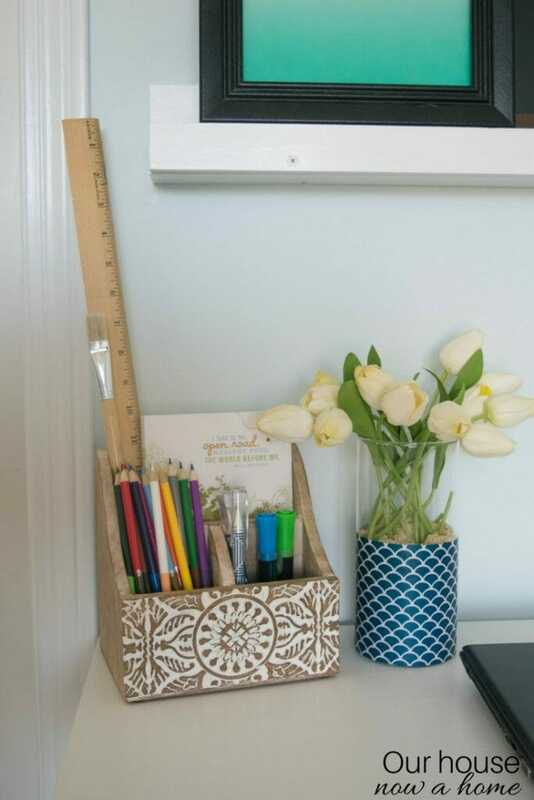 Combine any paperwork, notes, calendar or craft supplies and this desk becomes impossible to find anything or even have room to work. The last problem was the lack of style to the space, I never put anything on the walls. 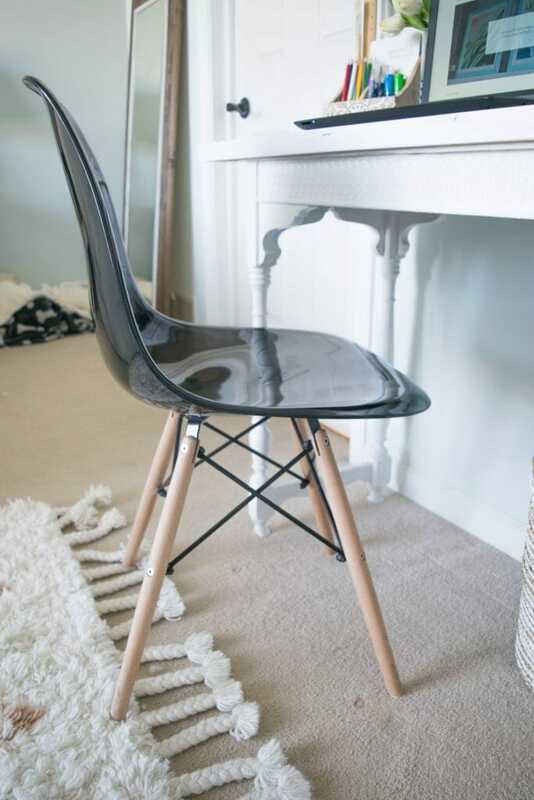 The desk chair is just a dining room chair. Yeah, it was a sad space for sure! Thanks to Cost Plus World Market and their great small space storage options, along with a little furniture revamp I was able to finally get the smaller office space I needed. 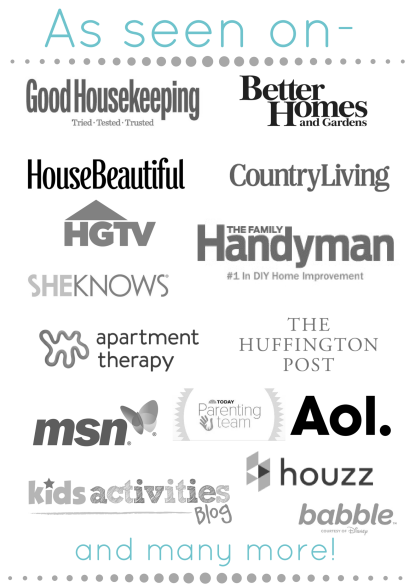 Guys, let me tell you… I am loving the final results! I added style, function, organization and a beautiful work space for myself. All without taking up a ton of square footage in my bedroom or compromising on the decor within my room. I will break down the nitty-gritty of how I created this new and organized space below. 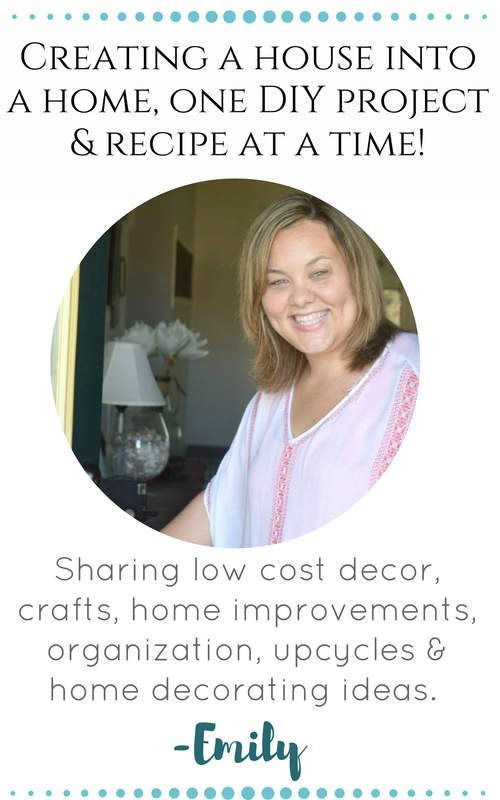 I used a few new items, two DIY projects, some simple crafts and a rethinking of the work space. 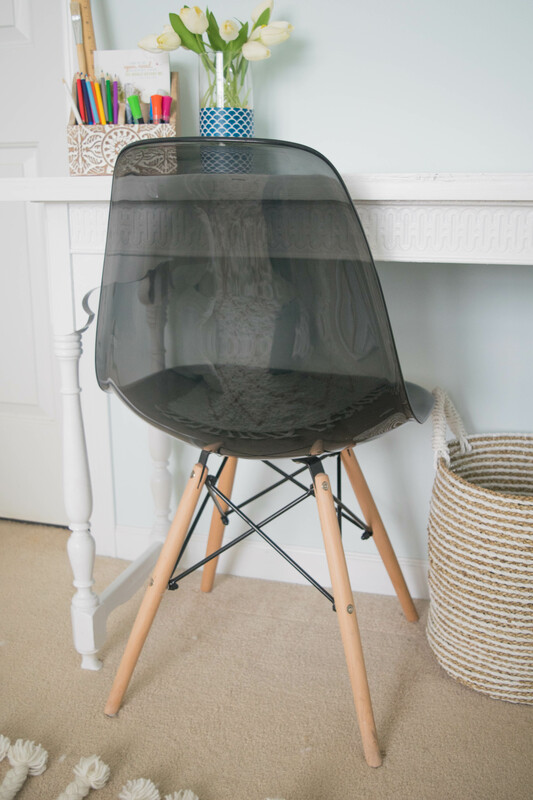 Creating an office space in a bedroom, adding function, organization and style that I desperately needed! 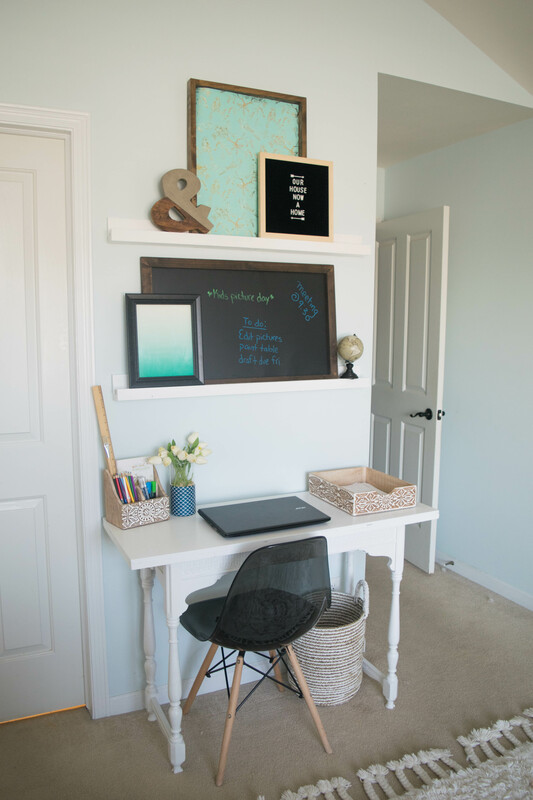 I should mention that I have also provided a shopping list at the bottom of this post, with all of the items I used to make this home office happen. 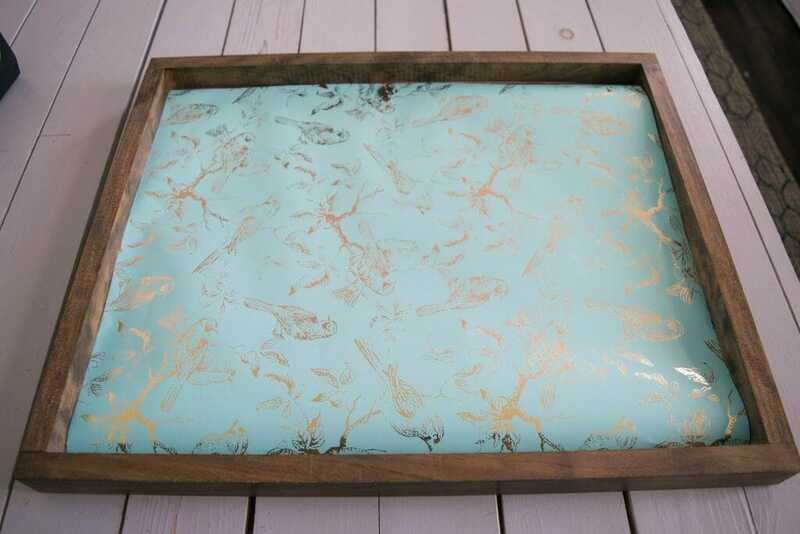 I will be sharing the simple DIY console table next week, it was a table that my Grandma gave me. 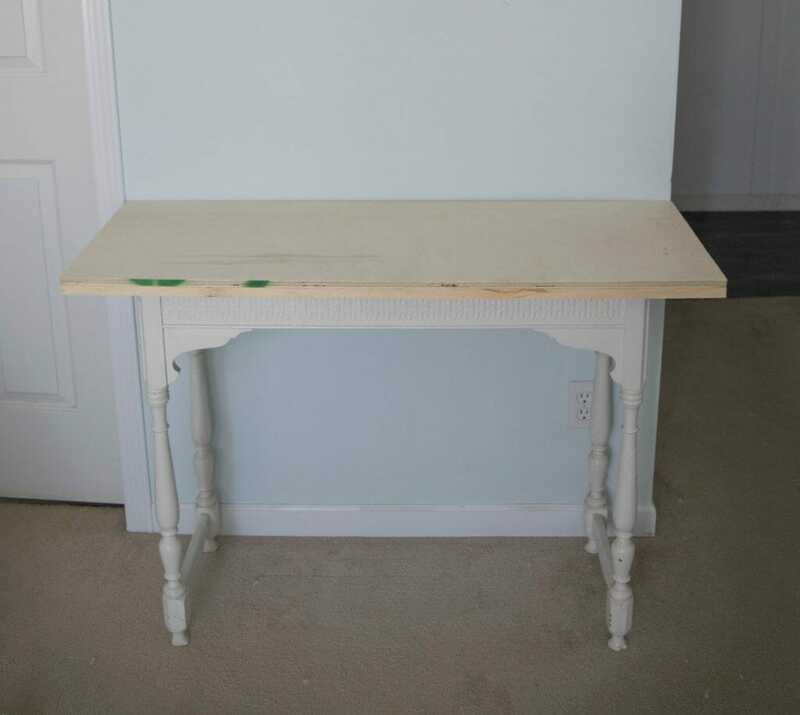 I love the look and details of it, but it was a smidge too small to use as a computer desk. I decided to add a longer table top to it. The great part about this table top is that it is not attached to the table. So I did not have to damage the special table from my Grandma! 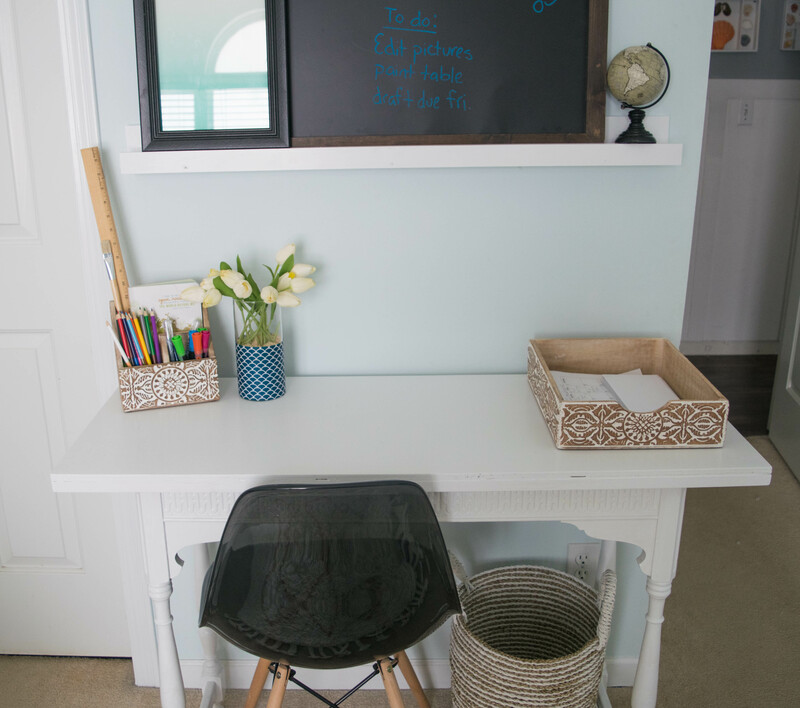 So how did I create this cute and stylish home office? 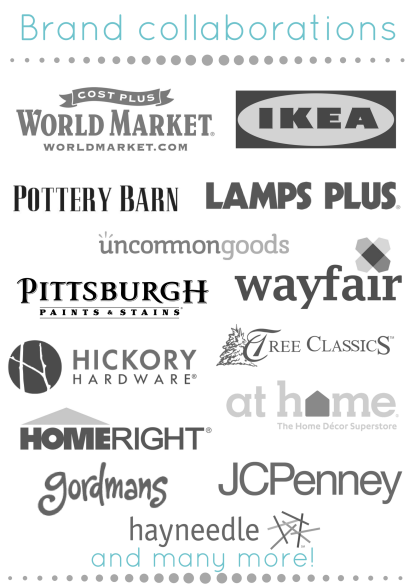 I went to my nearest Cost Plus World Market store in Brookfield, Wisconsin and focused on organization. The items I chose to improve that can be seen below. The style part of this was more of a challenge. How do I improve the decor for my home office nook without taking up any space? This is a narrow and tiny wall in my room, so nothing over sized or bulky would work here. 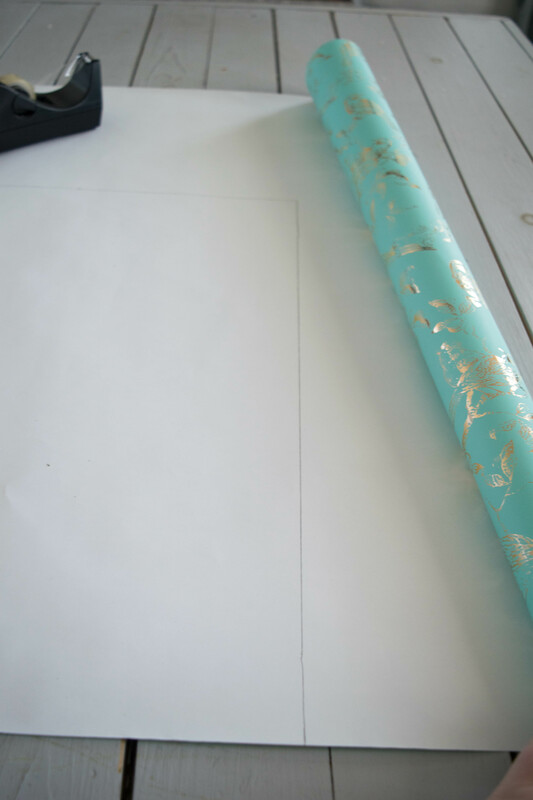 I purchased two cute wrapping papers and planned to make some custom art for the wall. 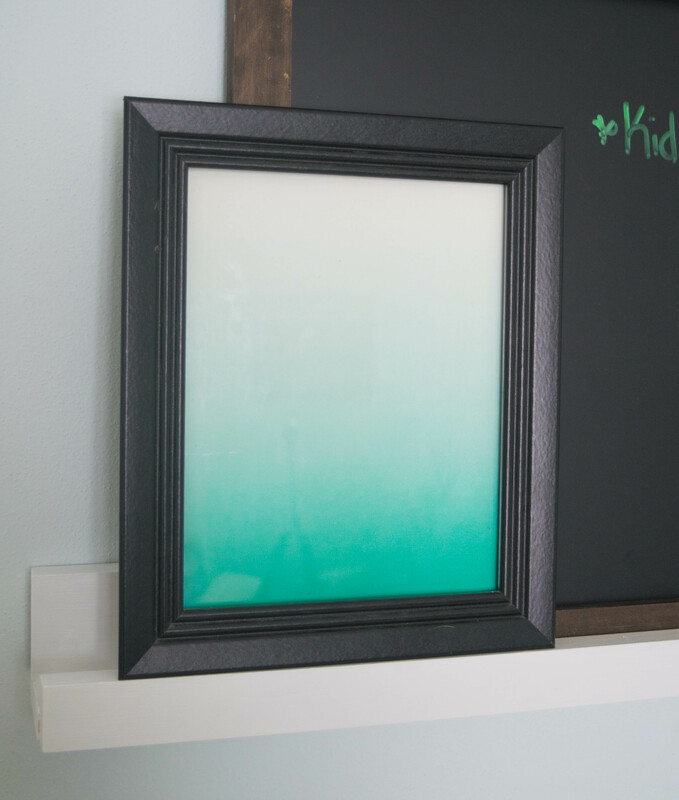 I made this DIY picture frame last year, the tutorial can be found here. 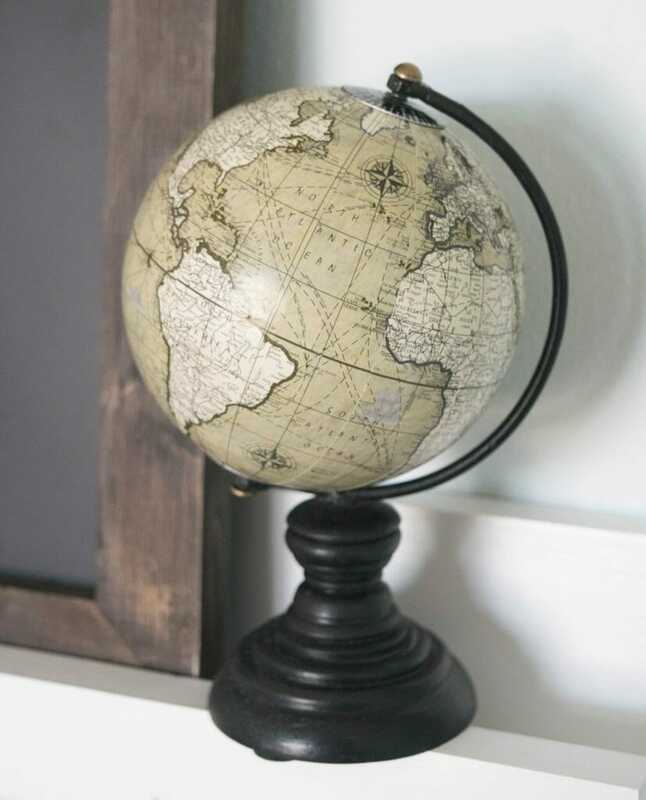 It is the perfect addition for my desk area, clean lines and a hint of dark wood which warms up the rest of the decor. Measure and mark the paper needed for the frame. Only the fanciest of craft supplies around here. I got rid of the natural rolling effect of the wrapping paper by putting it in the frame and then weighing it down. 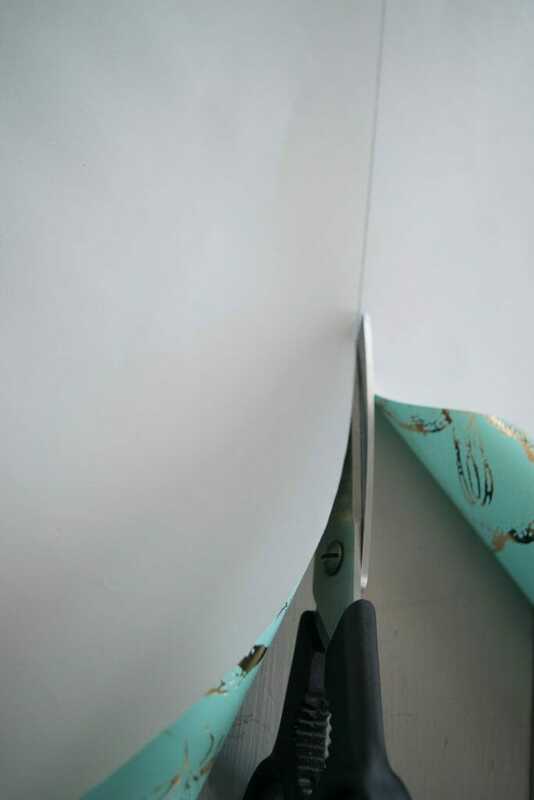 Leaving it like this for a few hours flattened the paper out perfectly. Once it was flat I simple taped the edges and corners down into the DIY frame. Can we just talk about how pretty this paper is?!!! 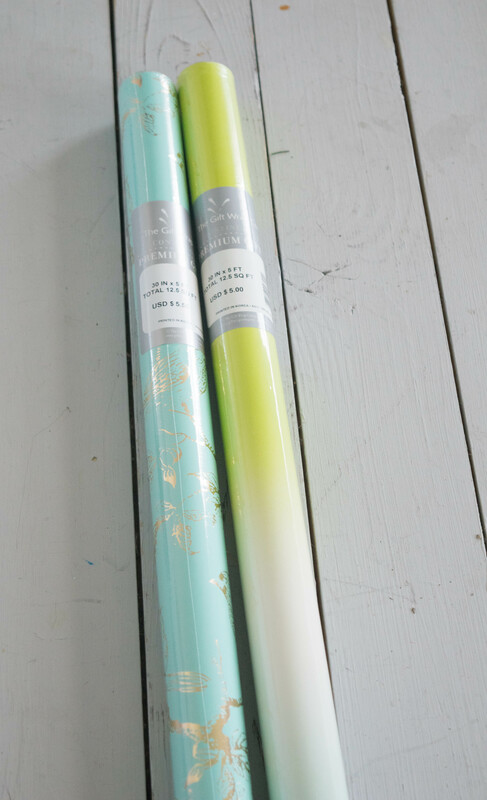 Getting beautiful wrapping paper like this allows me to use it in my home as decor or art, making it just the right size I need. I mean, I love me some massive wall art but sometimes a room calls for smaller options. 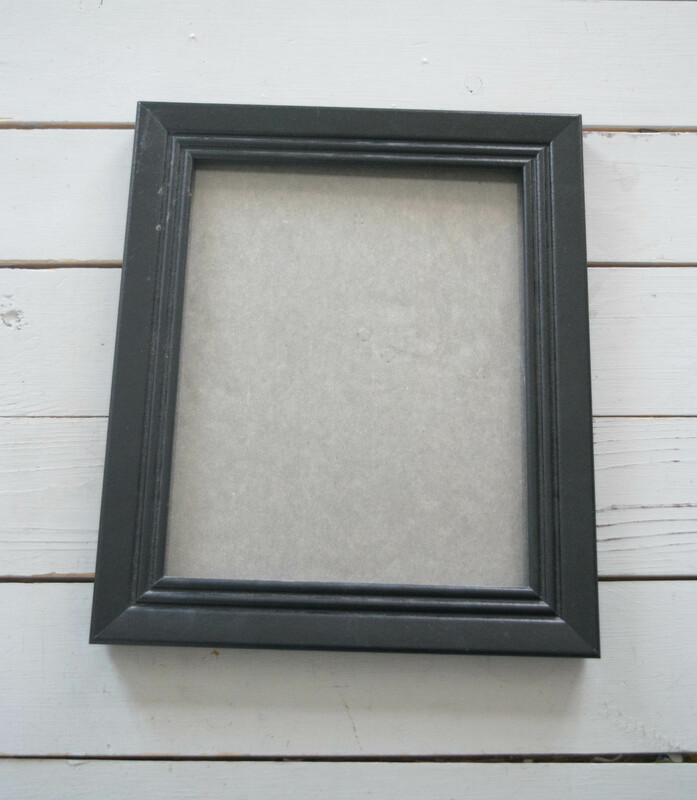 Next I used a simple black picture frame. Then cut out and inserted this amazing ombre wrapping paper that I found at Cost Plus World Market! Little decor items like this add a fun pop of color. With a work space, no matter my best of intentions it is always going to have a lot of action and clutter. 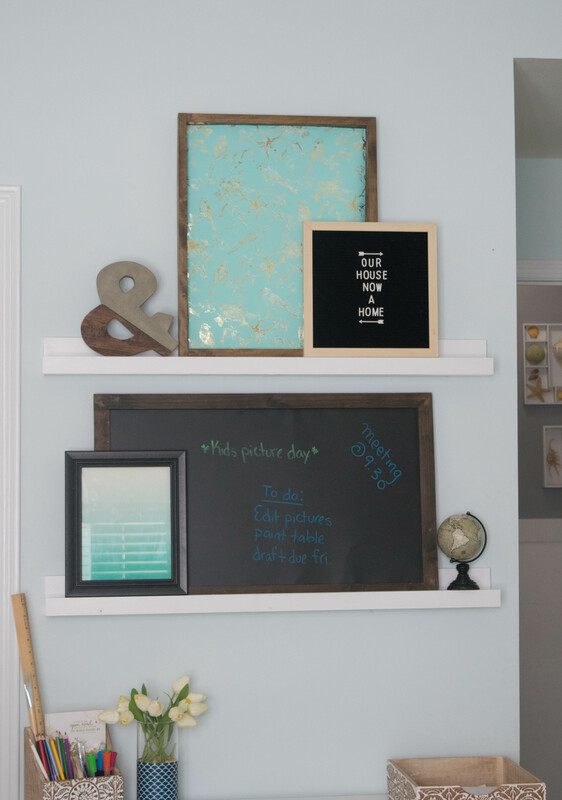 Adding smaller decor items like the wall art with some fun colors makes the home office space feel well thought out. 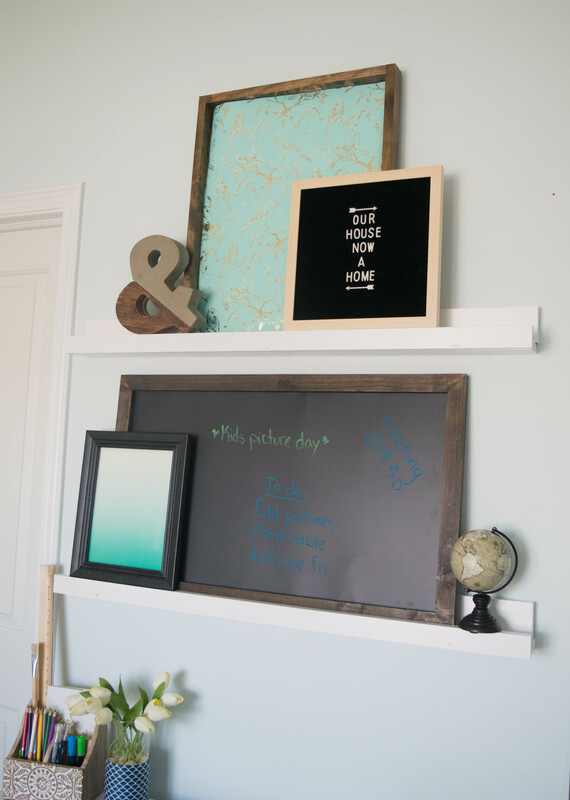 Another way I added decor without compromising on function is with this DIY picture ledge. I will be sharing the tutorial for this soon. 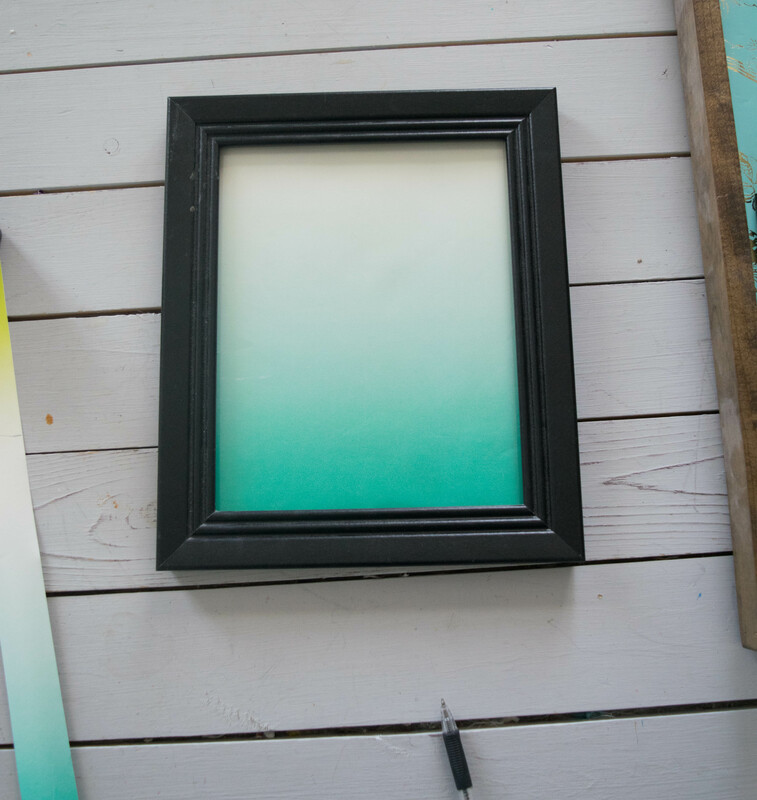 The picture ledge allows the wall decor to be layered in, giving depth, color and style to this space without overwhelming it. 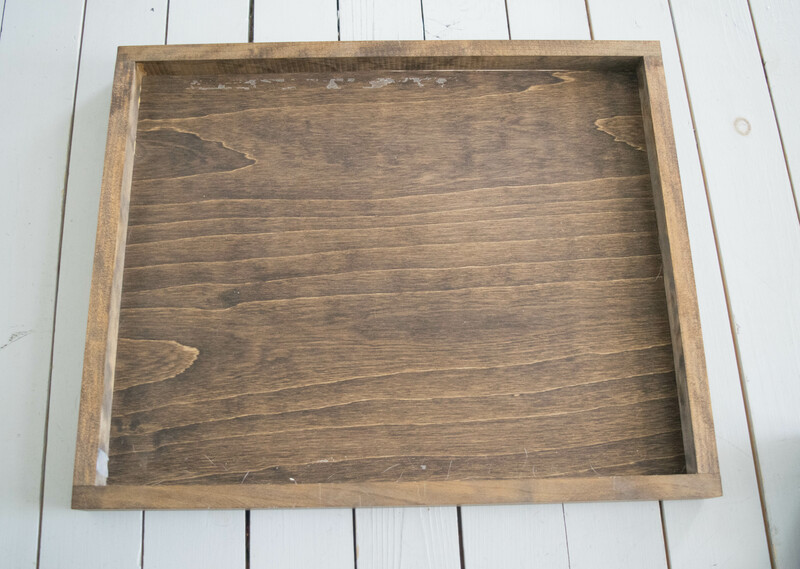 I have been wanting one of those letter boards and they had one at Cost plus World Market, I have been playing around with it a lot! This office space in a bedroom can get tricky, I do not want the space to feel like a full blown office. This is still my bedroom, my oasis to escape. I did not want my work glaring at me as I am trying to read a book in bed at night. Focusing on the overall style of the work space, and the organization ideas really made a big difference. I am able to work here, then put all of my things away at the end of the day. Adding the extra couple of inches to the table top of the desk really allowed me to gain some usable work space. The before picture I shared had a bunch of craft items on the desk. 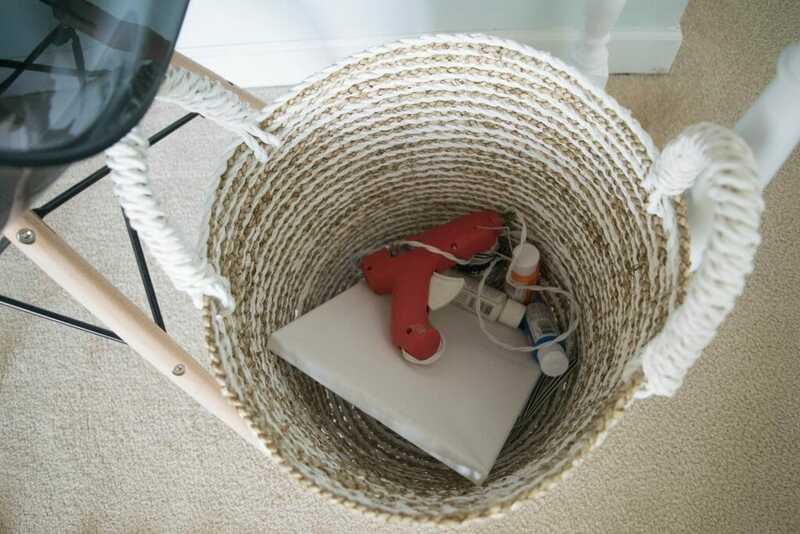 I did not just remove them from the space, I used this big and beautiful basket to hide these items. I should note that I have a massive craft storage area in my basement, but when I am working on a project sometimes it takes me a couple days before I am done. 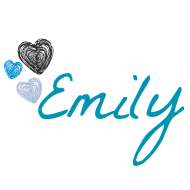 Procrastination, my kids, life…. everything gets in the way from me finishing in one day. So I like to keep these items on hand, now I can keep them convenient for me without cluttering up my work space! Let me tell you, having a designated office chair makes me feel very fancy! It also is a lot more comfortable than a dining room chair, my back thanks me each time I sit in this. I went with the darker color of the chair because I knew that the table and other decorative items are a light color. Toning that down with a dark chair is a wonderful contrast. It was time for me to get actual desk organizers, I am an adult after all. Also, it is much easier to find a pen or pencil now that they are not buried under stacks of papers. I am a pen and paper kind of person, I still like to write ideas, my schedule or reminders down. My husband cannot stand this, he uses his phone for all reminders. Different strokes for different folks, I need the physical notes as an option. The narrow desk and picture ledge work great for this wall in my bedroom. It is a wall that is super small but gets a lot of foot traffic. To get into my bedroom, bathroom or closet you round this corner. So keeping everything small is a must. Cost Plus World Market has a ton of small space furniture which works perfectly for a room like this. So if you do not have a small table from Grandma like I do, they have you covered with a ton of furniture options. This paper organizer may seem simple but it has been a game changer for my desk organization. I can still keep them all accessible but in one place. I pull out the paper or schedule I need, write on it, then put it back. It is also easy to remove from the table if I need my whole desk space to work on a craft. 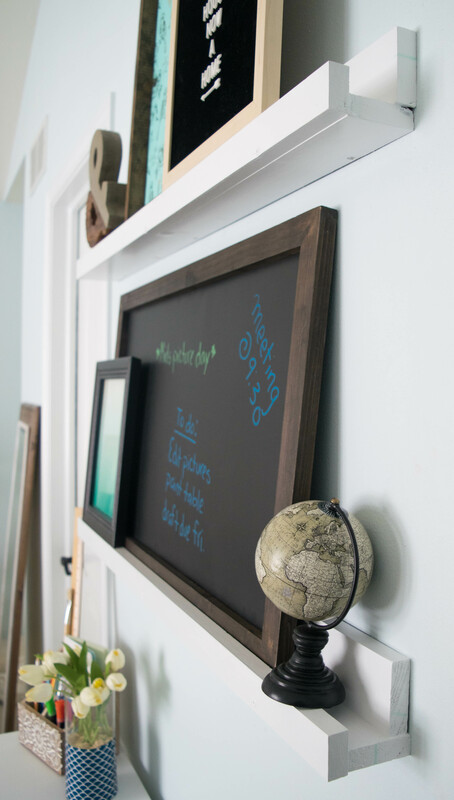 The chalk board has to be one of my favorite new additions for this office space. As I said before, I am a pen and paper kind of person. 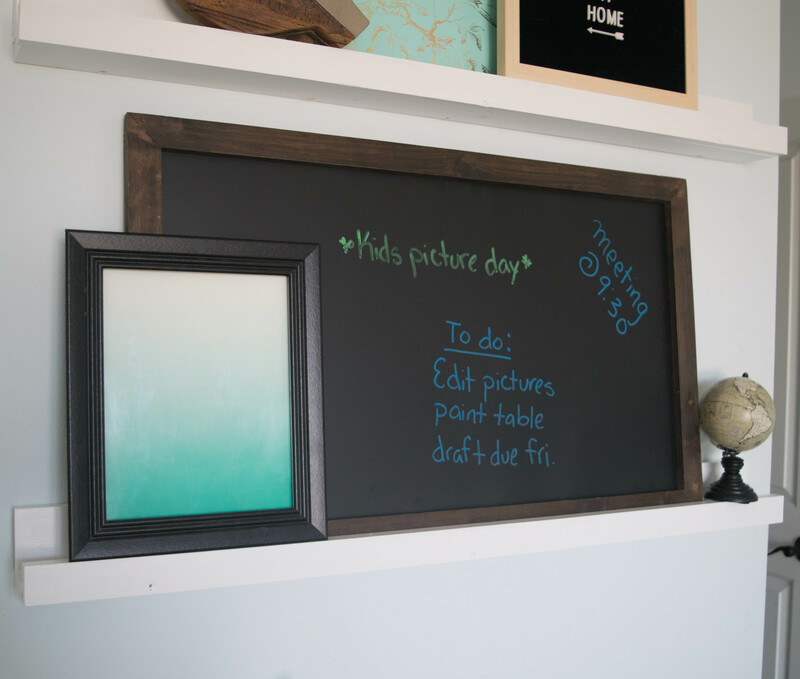 Having a chalk board right here that I can put notes and reminders on is even better. There is no loosing the note, or having my kids decide it is scrap paper they can use. Or you know, one of my dogs deciding the piece of paper is food. True story, my dog Finn ate a blog contract and check sent to me. Good times! Once my kids get to school I bring my morning coffee in here, turn on some music and get to work. The sun streaming into my bedroom is amazing in the mornings. I can just imagine how great this room will feel in spring when I can open my windows and get a relaxing breeze coming in. I am the type of person that is effected by my surroundings. So if my home is unorganized or messy it makes me feel a little off. If my work space is not organized I tend to avoid it. This little corner of my bedroom lets me get to work and feel ready to tackle my daily to-do list. I was very mindful of the decor items I selected for this home office area. Keeping in mind the scale of the decor as well as not adding too much clutter. The desk would have looked amazing with more decorative items, but I knew that keeping the desk space with minimal clutter was best. I was able to squeeze in a few smaller decorations on the picture ledge. The mix of white and pops of blue along with natural wood and pops of black feels like such a calming space! I don’t know about you, but my work space and office needs to be calming. Quieting the noise and clutter as much as possible. 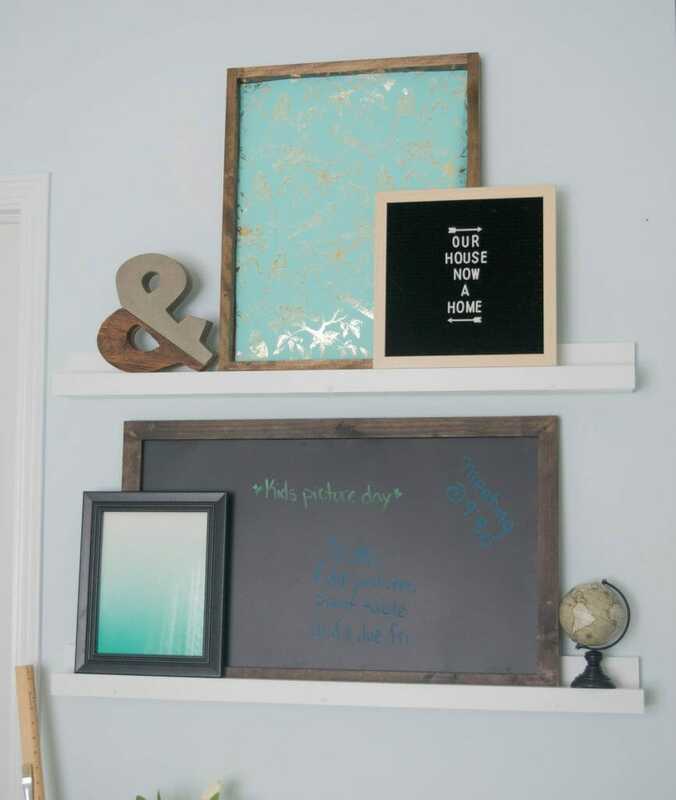 I am thinking that every office needs a chalk board. The function of it is huge! Jot down a note or reminder while on the phone and have it there ready to be seen. 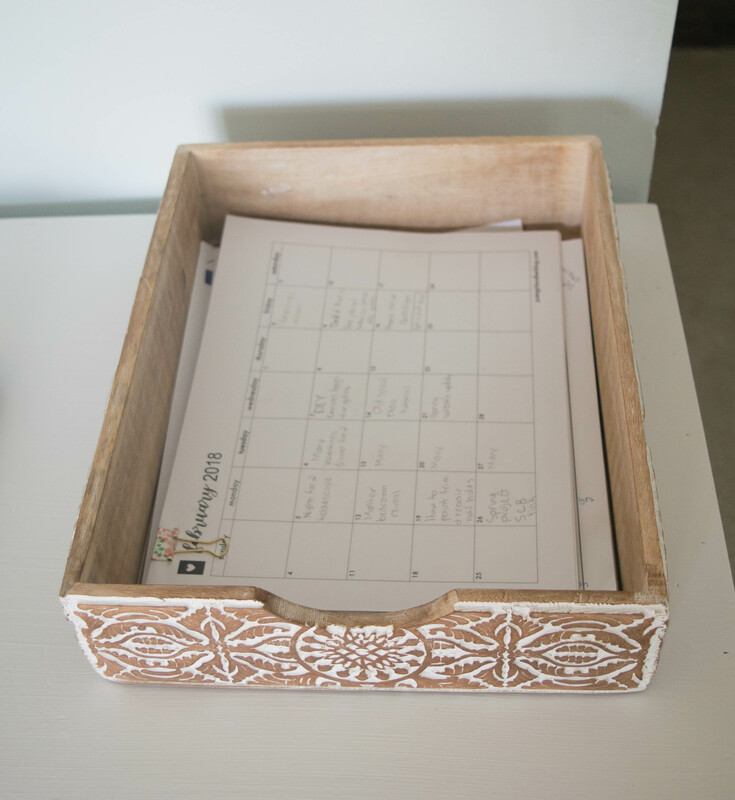 When I saw the desk organizers with their innate details and carvings I lost my mind! The desk I have has carvings and details as well. It felt like a match made in decorating heaven. 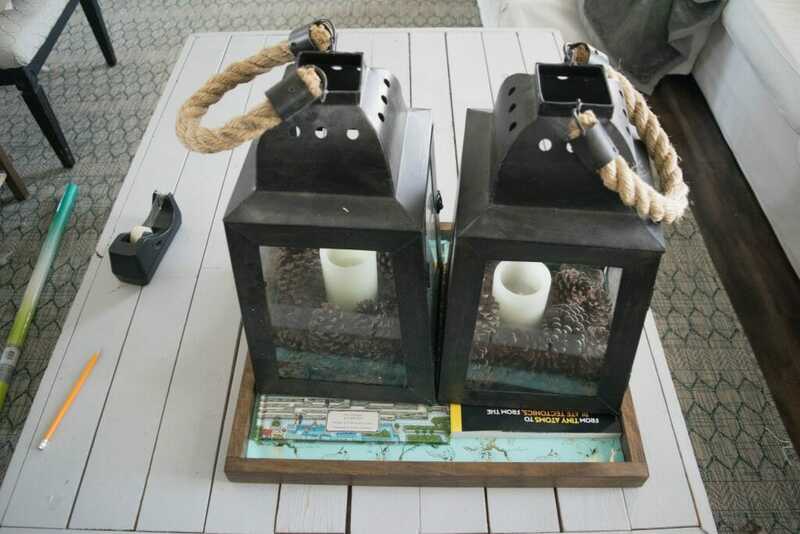 Getting to combine what you already have with a few new items is a great way to get exactly what you want in a room without going overboard on a budget. 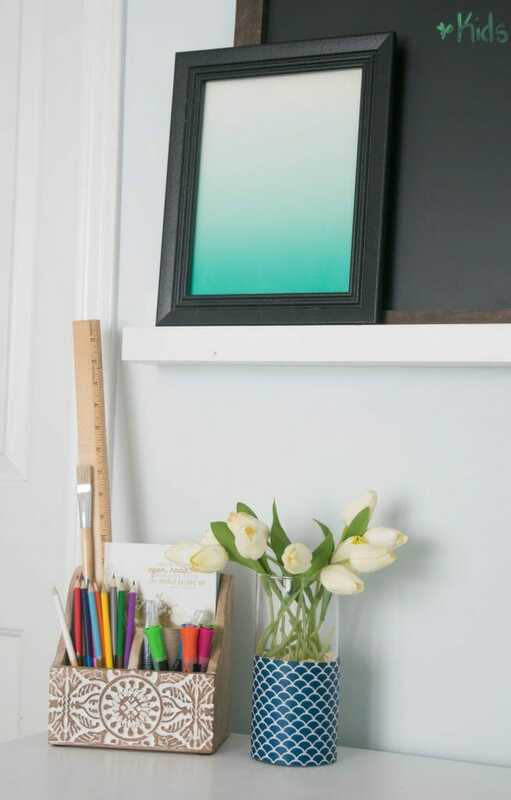 Using faux flowers for a work space is a nice touch. I would love to have real flowers and will always choose that when possible. But greenery and flowers have a calming effect, which is always welcome when dealing with a space that can be high stress at times. Cutest photobomb ever! Finn was ready for his close-up. I should get a home decor blogging award for the amount of times I had to re position my angle and camera to get this snoozing dog out of the shot. I felt one picture of his adorable face was ok.
As a reminder, the before is above and the after is below. I was careful to have the same items on the desk in the before picture also in the after. 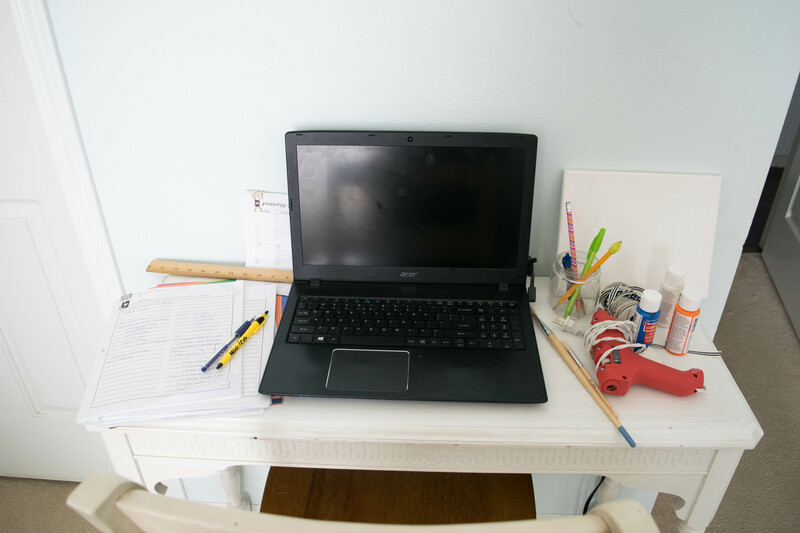 I did not want to cheat and claim “organize your desk…. 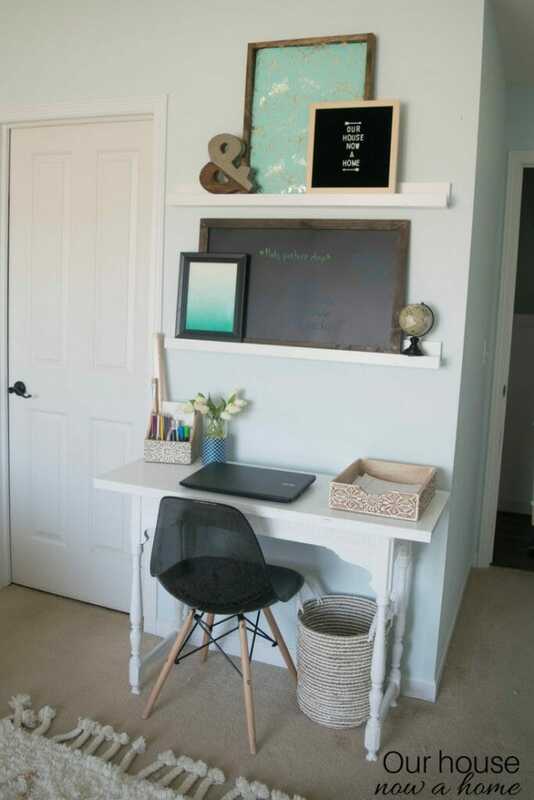 by removing all of the clutter” These are real solutions and how I made it work with a narrow desk and small space in my bedroom. In fact, not only did I improve the organization of my home office space. I also managed to add a ton of beauty and style to my desk area, which was my goal in making this office space blend into my master bedroom. No one wants to feel like your bedroom has the equivalent of a cubicle next to a bed. Blending in the “work” side and the “relaxing” side of the bedroom into one cohesive space is really important. 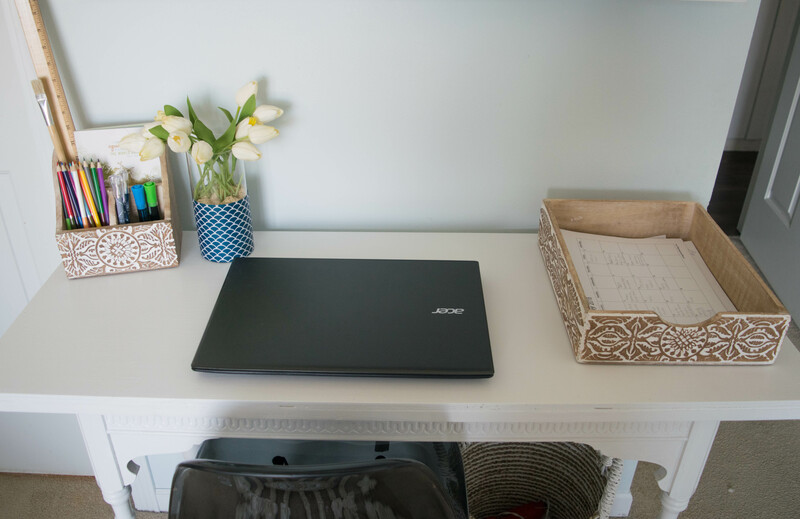 Creating an office space in a bedroom, adding function, organization and style was all about being realistic with my goals, my daily use of the space and the fact that I needed actual decor here. Some people can plop their laptop anywhere and get to work, shoving any mess off of the sofa and making it work. I am not one of those people, I know that I need a calming space to get work done. Knowing this and finally taking the time to make this space work for me has been amazing for my productivity. Also, no more losing pens or notes! I love that picture ledge idea. I have never seen something like that before, but I want to install one in my house now! Thank you! The picture ledge is a great use of a small wall space. I will be sharing the tutorial on how to make the picture ledge next week. 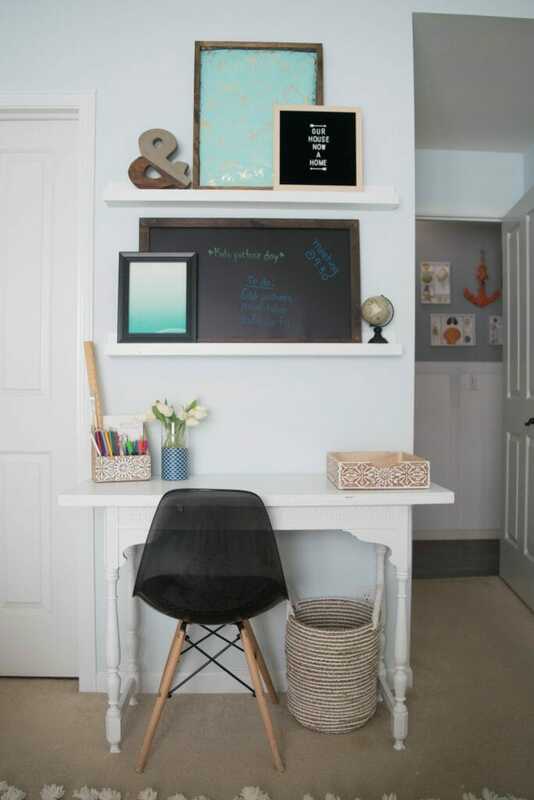 Wonderful idea to carve out some space in the bedroom if the bedroom is big enough to make a work space like this. Wasn’t expensive at all which makes it nicer yet. It is nice to have a designated work space now! This would be such a gorgeous work area! I might have to do something like this in our bedroom. There would be space along the wall. I have been wanting my own desk! 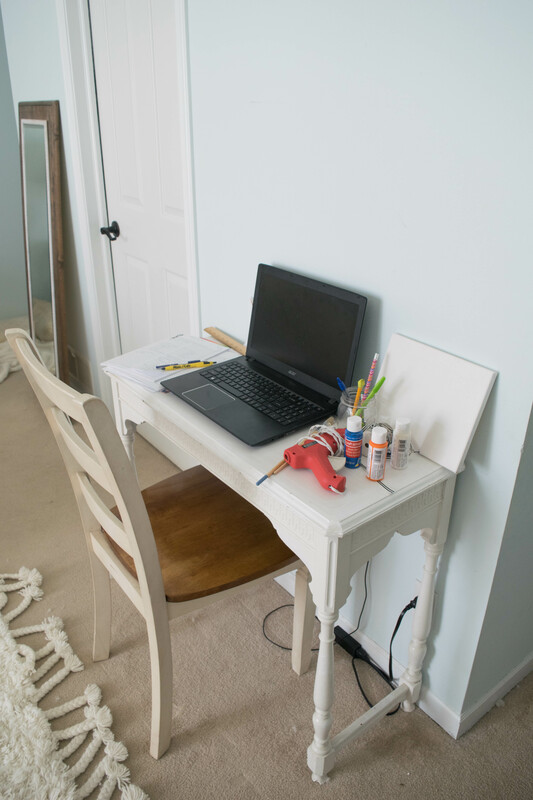 It is nice to have a designated work space, have fun creating your own desk area! This area is super sweet. We have a small home and while I have an office for the moment, that space is going to be needed for another purpose soon. I was struggling with where to put an office and this might work for me, too. A bedroom can be a really good way to utilize the space for an office! I haven’t considered setting up an office space in my bedroom because we have one set up near the den. However, I am loving that DIY console table and I can’t wait to check in next week for instructions on that piece. It would be nice to have an office space of sorts in our bedroom. I love your youtube video! So cute! You did such a wonderful job with that space! Thank you! I am just starting to really focus on videos more, I am glad you liked it! I love what you did with this space! 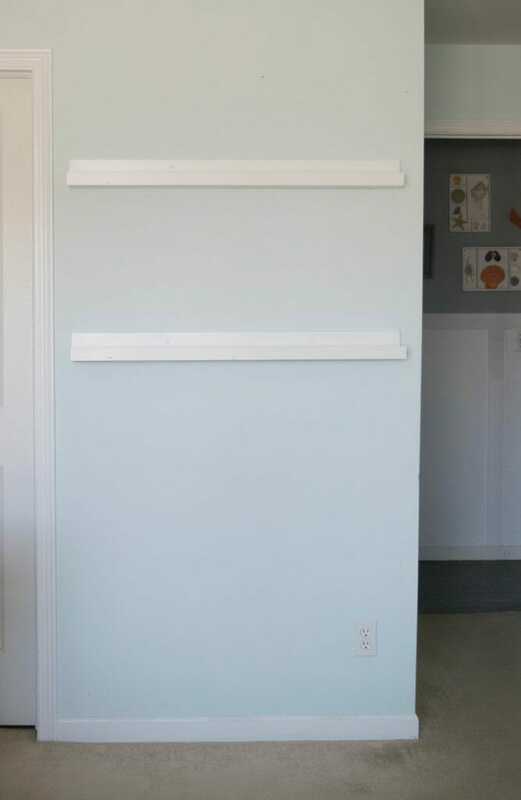 So smart to use the vertical wall space. The decorative elements make such a big difference (they are the pieces I always forget when designing my own workspace). This is great inspiration! Oh my goodness I LOVE how awesome your workspace looks, it might be small but definitely seems perfectly formed with everything you might need. Thank you so much! It is a small space but works really well for me! We used to have an office space in our bedroom. This is such a great use of a smaller space for a workplace. I love the idea of adding a workspace in the bedroom especially if you don’t really have an extra room or place for your home office. It’s really lovely, how it turned out and it’s going to help you be more productive than doing your work on the bed. I love everything about this. When we move, we will need to set up a space like this. Thank you! So far this space has worked great for me to be productive! Thank you! The different table top made a big difference even though it was such a small addition. I absolute love your home office! I have a small bedroom that I use as a home office and it’s not nearly so cute!! It came out awesome! 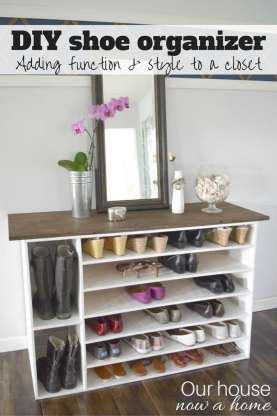 This is such a great idea to use the space for 2 purposes. You have really transformed the office space. 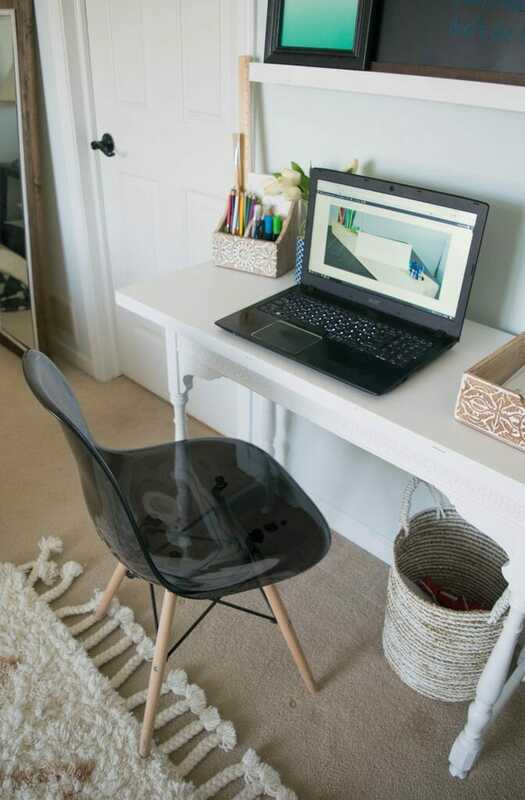 We too are looking to incorporate some office space in our bedroom too and we are definitely going to take a few ideas from you. Thank you so much! 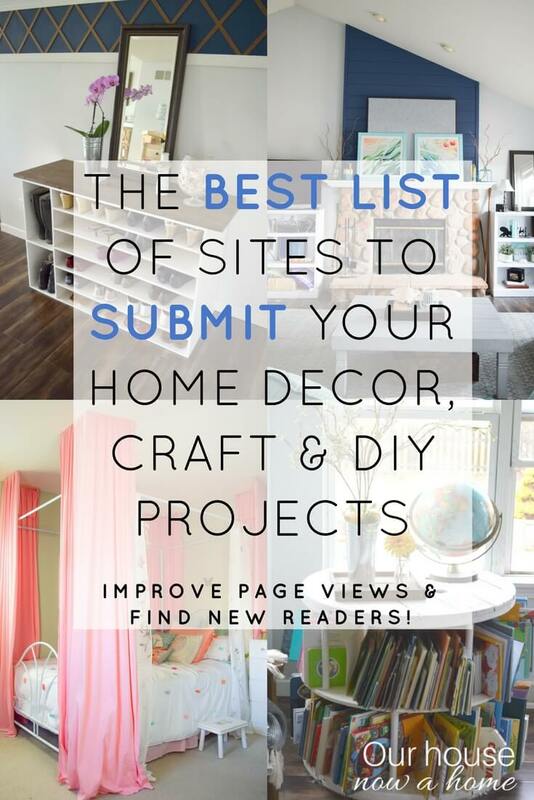 I am happy you have gotten some inspiration for your own home office, good luck with your space! I love this space. Small and cozy but very useful and productive. We are not limited on space, but are considering moving to a smaller house, so there I will need to get crafty like you did. What a beautiful office you have, I love all the details you put into it! I used to have my little office in our bedroom but when we bought this new home, I have a formal office and I am happy. Thank you so much! I would love to have a designated office space by itself, having a place to work or store all of my craft supplies would be amazing! 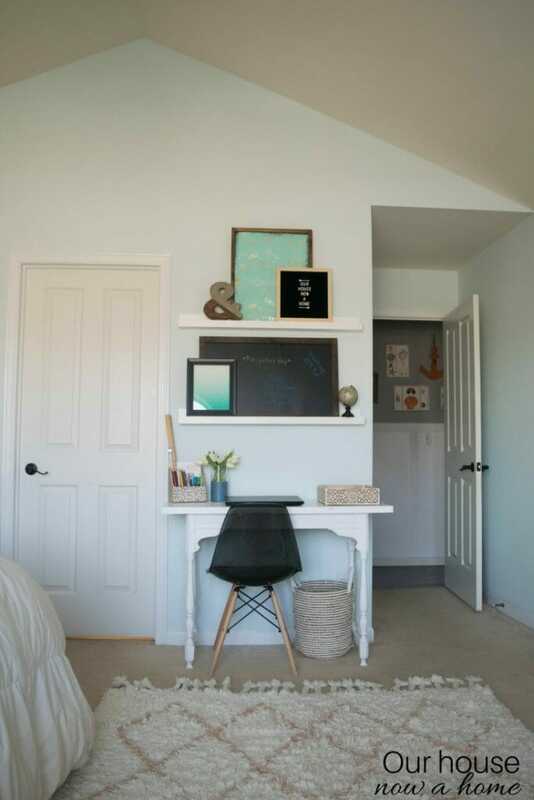 I love all of the items you used and the way you styled the desk and shelves. So practical, functional and super cute!! This is really useful information. I know a lot of people who are working with limited space. Thank you so much! 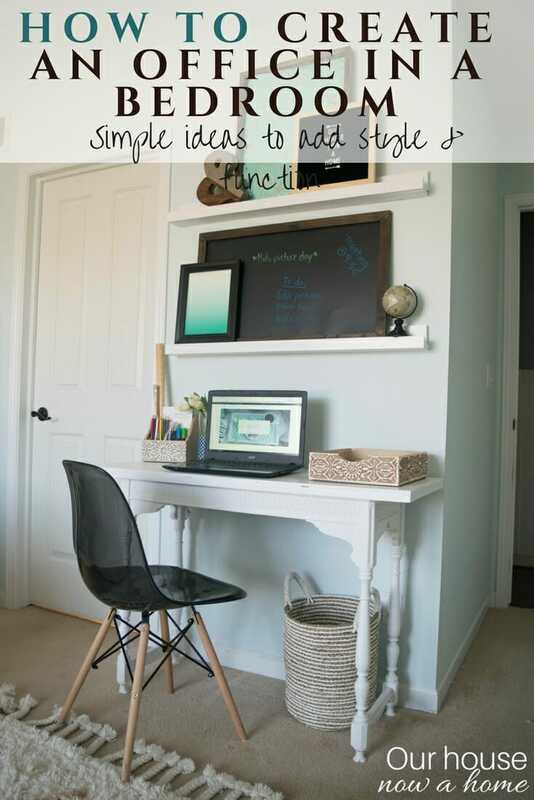 Most people do not have a designated office so have to get creative with their work space. I love what you did here, I set up a small office space in our living room. 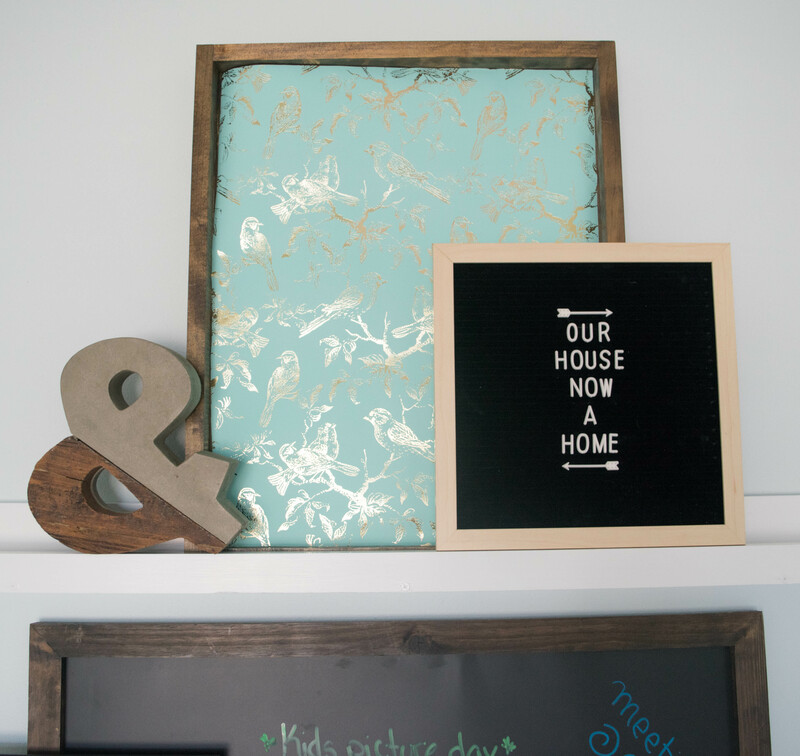 I also recently purchased a hot pink letter board from Target. 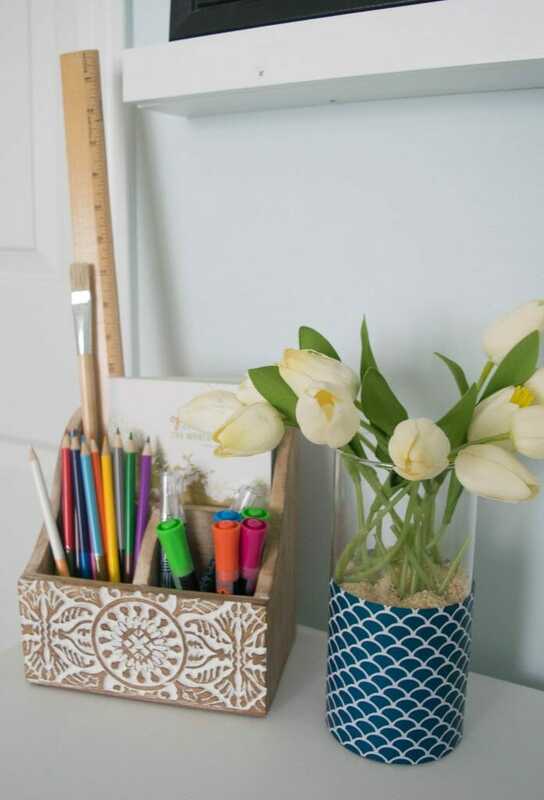 I love the basket idea you have under your desk with crafts. That is exactly what my space needs, my desk is a little junky because I have a craft project in progress. Thank you so much! 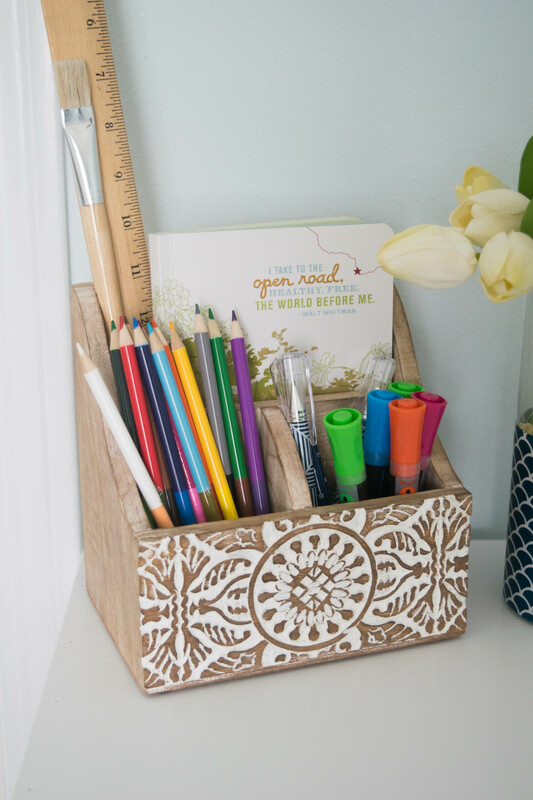 The basket is a really quick and simple way to keep my crafts off of the work space. Such a functional, wonderful and pretty office space in a very small wall! Just. GENIUS! I like the pops of turquoise! I am too planning to have a nice office space in my home. Bedroom is the best option. I love your desk! It reminds me of the one I had growing up. 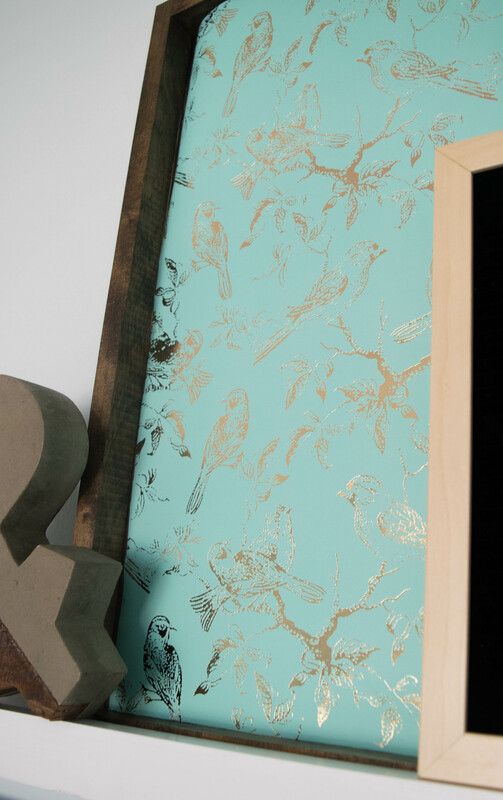 The beautiful details and touches really help pull the space together. Well done! Thank you so much! This desk actually was given to me from my Grandma, it was a desk that she redid herself. So I wanted to be sure to not damage it when I was adding the removable desk top. I am loving the dual use of your master bedroom, my room does not have the space but I can utilise the space in my open plan.